Joanna Marsh is a British composer who has been living in Dubai since 2007. She is the current Composer in Residence, at Sidney Sussex College, Cambridge and is also Co-Founder and Artistic Director of ChoirFest Middle East in Dubai, an annual celebration of the region’s choral music scene. Most recently she was commissioned by Dubai Opera to write an orchestral work for the first BBC Proms in Dubai in March 2017. This lead to her writing the 6 minute work Flare, for the BBC Symphony Orchestra, based on a short story called Oil Field, by Saudi writer Mohammed Hasan Alwan. Many of her other orchestral works were initiated in Dubai. Kahayla was commissioned by an international book company who wanted a composition to feature in a book celebrating the building of the Burj Khalifa. 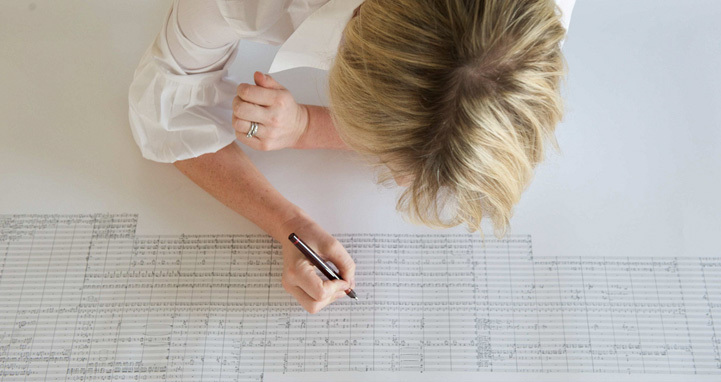 In response Joanna wrote a piece for large symphony orchestra, with its score hand written to form a giant drawing of the Burj Khalifa. The state visit of HM Queen Elizabeth to Abu Dhabi in 2010 lead to the commissioning of her fanfare, “The Falcon and the Lion” by the British Embassy in Dubai. Following this a number of works were commissioned both for brass ensemble and for harp duo by the Emirates International Festival of Literature. Joanna’s recent opera “My Beautiful Camel”, a romping comedy, was composed with librettist David Pountney and pulls in many cultural themes from the Emirate. The story is derived from her personal experience of working in the UAE. As a part of her residency at Sidney Sussex, Joanna is writing a series of choral works which will be recorded by the choir in 2018. Joanna (b. 1970) studied at the Royal Academy of Music in London and was an organ scholar at Sidney Sussex College Cambridge. She studied composition with Richard Blackford and Judith Bingham.